Although my eating disorder became full-blown in my late 40’s, the seeds were planted long before. The innocence of my early childhood was shattered when I was 7 years old. My father, a successful lawyer in Rochester, New York, divorced my mother, a smart, stay-at-home woman who was active in our suburban community. I was a shy young girl who had no opportunity to talk about the divorce or its impact; no place for tears, sadness, or anger; no place for feelings of any kind. My Mom went on as if nothing had happened. There is no doubt that my Mom loved me and I have many happy childhood memories for which I am very grateful. But, her suppressed emotions and undiagnosed mental health issues, caused her to be moody, rigid, controlling, and very hard on me. Even with food, she controlled what I ate, when I ate, and how much I ate. I never learned intuitive eating. My Mom supported my dream of becoming a professional tennis player, however, I grew up thinking the only way I could make my Mom happy was to get good grades in school and do well on the tennis court. I never felt supported if a grade didn’t meet her expectations or if I lost a match I could have won. The tennis court became my sanctuary, my escape from emotions inside I was unable to express. I felt I had to be perfect and always strong and at the time I thought strong meant always being positive and unemotional. I felt guilty for even thinking anything negative. I know my Mom was proud of my academic accomplishments and tennis success, yet I had no voice. There was no place for questioning her ways or expressing emotions. I just went along being a good girl and doing what was expected of me. Failure was not an option and that fueled my undiagnosed anxiety and prevented me from ever becoming a risk taker. I had to be in control at all times. During my sophomore year in college, my Mom was diagnosed with breast cancer. Such a scary, difficult diagnosis, yet I have no memories of significant conversations with her expressing either of our emotions or fears. She had a mastectomy two days before Christmas and then we went on with our lives. My Dad was not a part of our daily lives though he supported us financially from his life in Chicago. There wasn’t the technology there is today for us to keep in touch though there were certainly scheduled visits and occasional phone calls. Whenever we visited I always felt he was distracted. He worked a lot, even during short visits and he never really gave us his time or attention. He remained a very successful lawyer, yet went on to marry 3 more times. My dad was very critical of me. It was so hard for me when he put me in the middle between him and my Mom. I simply internalized any and all feelings and felt like no one cared how I felt. I would protect my sister from their heated arguments, but no one protected me. By my junior year in college, I was slowly trying to break out of the tight web my Mom had spun around me. I studied hard and played Division 1 college tennis. During a weekend visit with my Dad, I thought maybe a summer away from my Mom’s unrelenting control was something I wanted to try. My Dad helped me find a summer job and an apartment in Washington, DC. My Mom, however, could not be happy for me which was very hard because I still craved her approval. She was hurt, and sad that I would not be spending my summer at home, plus, the fact that my Dad made that exciting summer possible made it even worse. It was a life-changing summer for me. I worked in a law firm during the day, played tennis in the evenings, and even won a big tournament in the DC area. My identity was still very strong as a tennis player but I was learning how to be independent and make decisions for myself. My Dad traveled often to DC for work so one of the highlights of the summer was that I was able to spend time with my Dad and develop a relationship that we never had. Just a few months later when I was happily back at school for my senior year, my Dad was diagnosed with colon cancer. It had already spread to his liver and he was given a year to live. He lived two years, dying in October 1986 at the age of 56. I was 23 years old, a year out of college, and I felt completely on my own in the world. After graduation from college, I had accepted a job at the law firm where I had worked the previous summer. My Mom was devastated that I was not moving back to Rochester. She treated me as if I were divorcing her, just as my Dad had 14 years earlier. My Mom made me clear out all my things from my room including even the contents of my desk drawers. She told me if she couldn’t have me at home she didn’t want any reminders of me. It felt like a knife to the heart. The concept of home as a place of unconditional love, a place where you are always welcome would never be the same. So off I went to make a life for myself in DC, fortunately equipped with all I had learned from the previous summer and with the understanding and support of my terminally ill father. I will always be grateful for the time I had with my Dad during my early adulthood in Washington, DC. Less than a year after my father’s death I started law school. It was a time of incredible personal growth, intellectual challenge, friendship, and I met Jeff, the man I would marry the summer following our law school graduation. After our 1990 wedding we moved to Rhode Island and in 1993 our daughter Rebecca was born. Then less than a year later, my Mom literally ended up on our doorstep. She had hit rock bottom financially and a family friend gave her a few thousand dollars to start a new life in Rhode Island. We helped her find an apartment and two part-time jobs. I was never able to tell my mother how I truly felt or how deeply she had hurt me. She became a wonderful grandmother to Rebecca and for the first time in my adult life my Mom was able to understand me and my life. And my Mom, who in a heated argument a few years earlier had told me that my wedding was the worst day of her life, even got to know and appreciate Jeff. After two good years, she was gone. Her breast cancer first diagnosed 14 years earlier came back in every bone in her body. She died in November 1996 at the age of 60. I was 33. After very complicated and difficult relationships, I had two good years with each of my parents before cancer ended their lives way too young. In 2002, the birth of our twins Alexis and Matthew brought a deep sense of joy and happiness. All of my time and energy went into taking care of my 3 children. Then, over the course of the next several years I was diagnosed with asthma and had several serious flare ups. I didn’t know how to rest, take care of myself, or let others help. I was the mom of 3 children, and I absolutely needed to be able to take care of them. I was used to going nonstop and being the mom I loved to be. A few years later, I found myself back into tennis after meeting a woman who had also played college tennis, and was now, like me, a busy mom. Tennis had defined me and my life for so many years and that identity returned as I played more and more. I started playing competitively again and my passion for tennis was reborn. I got many positive comments and it made me feel good about myself. Around this time my relationship with Rebecca was becoming very strained. She suffered from severe anxiety which had yet to be diagnosed. It was her last couple of years of high school and she took all her stress out on me. During this time, I continued to have occasional major asthma flare ups which prevented me from playing tennis, which was once again my outlet for stress. I still had a hard time accepting my chronic disease and these times of inactivity led to anxiety and bouts of depression. A close friendship came to an end as well. She was an asthma specialist who would get upset with me for not taking care of myself during those bad asthma episodes. I knew nothing about self-care. It was the perfect storm – difficult situations with people I loved or cared about and a disease that made me feel out of control. I was not able to be the mom I wanted to be and was not able to play tennis, a source of self-esteem and escape from confronting and expressing my feelings. My anxiety got worse and my eating disorder came to the rescue. My eating disorder became my coping mechanism and got worse as my fear of gaining weight intensified. I listened to ED and he made me feel good about myself. I listened to ED and he made me feel in control. In recovery I had to learn that it was ED who was in control, not me. A therapist I had been seeing occasionally to help me deal with managing a chronic illness suggested I see a nutritionist because of my weight loss, though he knew nothing about eating disorders. At my first appointment I was diagnosed with anorexia. I knew I had lost weight, but I had no idea how consumed I was by constant thoughts about food and exercise. My eating disorder was impairing my life and endangering my health. My recovery journey took me places I didn’t know I needed to go. My treatment was all outpatient because I was not willing to disrupt my family life. I began regular appointments with my nutritionist and a new therapist who specialized in eating disorders. Recovery is not possible without having someone who supports you and is there for you every step of the way. For me, that person was my nutritionist. During my recovery I often felt isolated and unable to talk about what I was going through except with my professional support. Having an eating disorder was exhausting and consuming, but around my appointments, I went on with my life. My dietician not only helped me with meal plans and weight restoration, but she also helped me to recognize that I had needs of my own and that taking care of myself and my needs was not selfish. From her I learned so much about myself and about life. I had a safe place where I could let my guard down and be open and honest about my eating disorder, my emotions, and life’s challenges. I learned to be vulnerable which was particularly hard for me. She gave me care I had never had before. I learned so much about nutrition and how to nourish my body as well as my mind and spirit. She always knew exactly what to say to help me, stay on track, or get back on track. “Do the next right thing” she would say giving me the encouragement and support I needed. She never gave up on me through all the ups and downs and I will always be grateful to her for her huge role in my recovery. From my therapist I learned so much about how the difficult experiences in my life had shaped me. I could talk about the complicated relationships with my parents and how there was no place for feelings and emotions as I strived for perfection in order to feel their love and earn their approval. The process of unraveling the layers and layers of suppressed emotions continues today. Two other important things contributed to my recovery. For 8 consecutive weeks in January/February 2015, I attended a NEDA Support Group for women over 35. I drove from Rhode Island to Newtonville, often through traffic and snow. The first week I left the group feeling that I didn’t belong, thinking of myself as so much healthier than the other women. I went home and went to the gym, the only way I knew how to cope with all the unspoken feelings I experienced from being there. Over the next several weeks I somehow felt compelled to go back despite being in the midst of a bad asthma flare up. I didn’t feel comfortable sharing at the group meetings, but I was committed to going back each week. I couldn’t relate to the women in the group. I felt sorry for them and wanted to help them. Then something happened in the 8th and final week. I was very emotional, crying in the car and at the group. I finally acknowledged to myself that I actually belonged there. I was able to share some of my feelings about the shame and secrecy I felt with my eating disorder. I finally allowed myself to feel the support that was there for me all along. I found NEDA to be a warm and welcoming environment and I absolutely loved all the inspirational quotes all around. I started keeping a special notebook with inspirational quotes from a variety of sources. Whenever I had a particularly difficult day in recovery, reading through my quote book empowered me and helped me to keep going. My dietician and I shared quotes about recovery and about life which I would add to my special notebook.Looking back, one of the most significant quotes for my recovery was: “you don’t have to be positive all the time. It’s perfectly okay to feel sad, angry, annoyed, frustrated, scared, or anxious. Having feelings doesn’t make you a negative person, it makes you human.” This quote was so significant because to believe it would require that I undo everything that had been ingrained in me from a young age. I literally needed permission to feel. The fact that the emotions flow freely now is proof that I no longer use my ED to numb those emotions. The most difficult experience of my life was probably the most important chapter in my recovery story. In February 2017, I had a total abdominal hysterectomy because of an ovarian tumor which thankfully turned out to be benign. This experience reinforced my commitment to self-care not only for my body but also for my mind and spirit. During the two months of recovering from surgery I had no choice but to rest. I had to nurture my body with rest and nourish my body with food. This surgery experience was a powerful reminder that you only have one body, so you need to take care of it. I survived major invasive surgery and would do everything I needed to do to be able to heal and resume my life. Never before had I felt such a deep appreciation for good health. This experience strengthened my ED recovery giving me a fierce determination to be as strong and healthy as possible. I wish I could say that recovery is all sunshine and rainbows. It was not easy to accept that there is no actual finish line as I once assumed there would be. The task is to remain strong in recovery in the face of life’s challenges, and use healthy copying mechanisms for life’s challenges and difficult emotions. For the rest of my life I will have to manage this illness, without the support I once had. My recovery gets stronger each and every time I nourish my body, mind and spirit, fuel my exercise properly, and take care of my own needs. I need to be with people with whom I can be my authentic self and I need to connect with those who understand what recovery is all about. My voice is what matters, not Ed’s, and every time I share my story, it empowers me and strengthens my recovery. “You fall, you rise, you make mistakes, you live, you learn. You are human, not perfect. You have been hurt, but you are alive to breathe, to think, to enjoy, and to chase the things you love. Betsy Brenner resides in Barrington, Rhode Island with her husband and sixteen year old twins. A lawyer by education, Betsy has been coaching high school tennis and facilitating a Bereavement Support Group in her town for many years. Writing and sharing her recovery story from a mid life eating disorder has been an empowering experience. 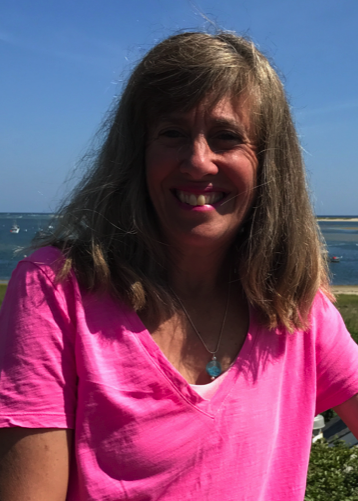 She has shared her story at several treatment centers in the Boston area and is excited to be speaking at the Kingston RI NEDA Walk this month.